A LEADING toothpaste manufacturer has paid £1,000 to a child whose teeth appear to have been damaged by fluoride. In what is believed to be the first such case, Colgate-Palmolive made a "goodwill" payment after an independent specialist diagnosed the boy as suffering from a condition linked with fluoride. At the same time, The Sunday Telegraph has also learned of research, kept hidden in America for 50 years, suggesting that fluoride can damage the central nervous system and teeth. Sharon and Trevor Isaacs, of Highams Park, Essex, were paid by Colgate after their 10-year-old son Kevin was diagnosed as suffering from dental fluorosis, where the tooth's enamel is mottled by fluoride. Colgate-Palmolive has denied liability and refused to discuss the case. But yesterday lawyers said that the settlement was a breakthrough and would trigger a flood of compensation claims. More than 200 parents are already attempting to claim damages from toothpaste manufacturers. They will be helped by documents just declassified by the US government showing that scientists had evidence in 1944 that fluoride could cause confusion, drowsiness and listlessness. The discovery is believed to have been made at an atomic weapons base. Further research was ordered but stopped six months later. Dr. Phyllis Mullenix, a toxicologist at the children's hospital in Boston, unearthed the papers after carrying out what she believed was the first study on the toxicity of fluoride in rats, which suggested it accumulated in the brain and could lead to a lower IQ. "Fluoride should be treated as a drug. Dentists say fluoride reduces fillings and cavities. But there seems to be no detailed critique of the data," she said. Sir Ivan Lawrence, Tory MP for Burton who heads a group of MPs campaigning against fluoride, said: "I think the evidence will continue to mount and there will be a ban in five or 10 years." Julian Middleton, a Nottingham-based solicitor acting for more than 200 children with fluorosis, said the payment could help families in their battle for legal aid. "We regard it as extremely significant  albeit it has been made without liability. Fluoride is one of the most poisonous substances known to man. Experts say it is a cause of fluorosis. Yet there is nothing to say what is a safe dose for children." There is a growing public opposition to the practice of water companies adding fluoride to supplies. Campaigners say the health risks have not been fully measured. But doctors and dentists say fluoridation is effective against tooth decay. Severn Trent, Northumbria and Anglian water companies have gone ahead with it. Mrs. Isaacs said her family did not have fluoridated water and had never used fluoride tablets. "I always used Colgate's Minty Gel and the pea-sized amount as recommended. Kevin didn't eat sweets and I used to make sure he brushed his teeth twice a day. He did use to swallow the toothpaste. I rang Colgate, but they said he would be all right." 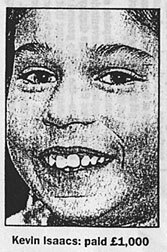 Mrs. Isaacs said Kevin, who was teased at school over his "rotten teeth", had been treated. A letter from Colgate-Palmolive shows the company believed the cost of coating Kevin's teeth when he reached 17 would be £1,000. He has had the mottled enamel removed. Colgate-Palmolive said fluoride was a major factor in reducing decay. Since 1990, labels recommended that only a "pea-sized" amount of toothpaste be used under supervision for children under seven. It admitted there was a "very small risk" of mild fluorosis. Young children exposed to several sources of fluoride when teeth were developing were most at risk. But this was "very small" compared with the "huge benefit" in preventing decay.